La Antigua is a cultural fusion of ancient Mayan & traditional Latin cultures, with a moderate European influence - combined with a steady tourism industry and a moderate expat community, Antigua has become one of the most diverse and popular cities in Central America. 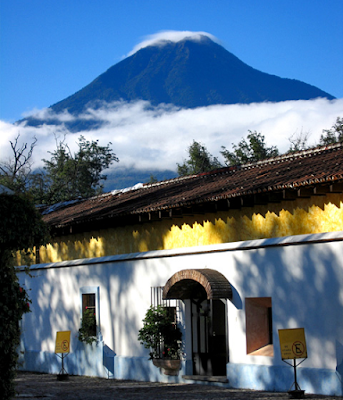 Antigua Guatemala is located in the highlands, situated in the heart of Central America, and is among the world's best preserved colonial cities. This charming and historic city makes you feel as though you have stepped back in time 300 years, from its colonial architecture to its beautiful surroundings; strolling through this colorful town on the ancient cobblestone streets, you will experience the splendors of the past in a mild year-round climate. Antigua, a UNESCO World Heritage Site, was founded in the early part of the 16th century; built 1,500m above sea-level in an earthquake-prone region, the city was largely destroyed by an earthquake in 1773, though its principal monuments are still preserved as ruins. In less than three centuries the city, which was built on a grid pattern inspired by the Italian Renaissance, acquired numerous superb monuments. Antigua Guatemala offers something for all travelers, rich in colonial history with an abundance of cultural activities from art galleries, fiestas, films, adventure and cultural tourism. Enjoy the diverse Mayan and Latin cultures, hike Volcanos Agua, Acatenango, Fuego or nearby Pacaya (the latter two active volcanos) - maybe take a day-trip to Monterrico, a black sand beach on the Pacific Ocean. Antigua is the perfect base for short trips to Lago Atitlan ("most beautiful lake in the world") or the Coban Ruins with nearby Semuc Champey, one of the most interesting geological formations anywhere; at Tikal National Park, located in a rainforest, you can explore ruins of an ancient Mayan civilization in a city inhabited from the 6th century B.C. to the 10th century A.D. Many visitors volunteer with NGO's building houses, some help improve the lives of others through education, etc. - some volunteer at the local hospital or farms just outside town. Antigua is also a popular destination for students to learn Spanish, with a numerous Spanish Schools offering various levels of instruction. La Antigua has a variety of historical, cultural & art museums. Santo Domingo Museum, the largest and richest monastery in Antigua, was established in 1542, or the same year as the city was established. Museum of Colonial Art is a fantastic piece of 16th and 17th century colonial art in regards to architecture. The Museum of Santiago de los Caballeros is located in front of Central Park and offers five exhibition rooms with ancient paintings and sculptures.